Prior to the organization of the Fire Police Company as we know it today, two men from each company were assigned to act as Fire Police. This procedure served until about April of 1949 when Assistant Chief William Bennett saw the need for a separate Fire Police company. He approached Lawrence McMahon and asked him to assist in forming a Fire police company. Mr. McMahon, an ex-member of Southampton Hose and ex-Policeman, accepted the challenge. The Department Council passed a motion on April 13, 1949 that Lawrence McMahon, with the aid of three or four men, was to organize a Fire police Company not to exceed 15 men. 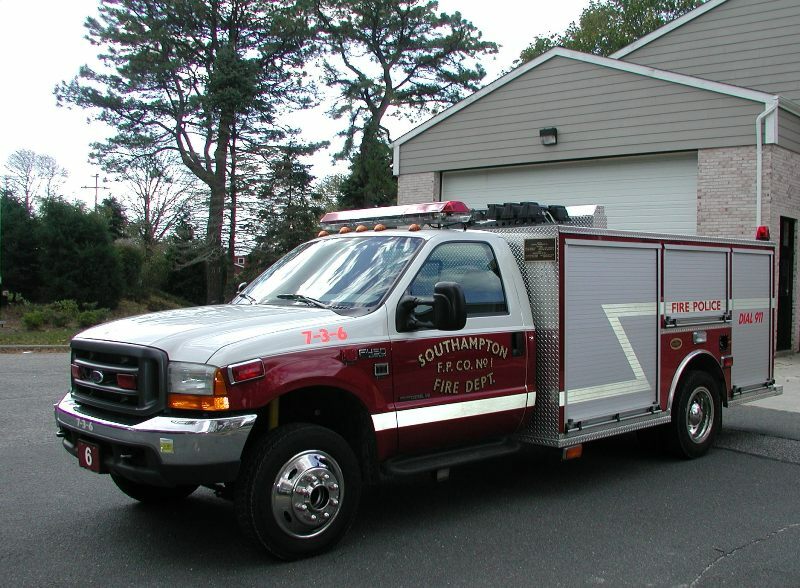 The Southampton Fire Police Company was accepted as a bonafide company of the Southampton Fire Department on May 10, 1950 and became the 5th company that makes up the Southampton Fire Department. Ex-Chief William Bennett, auto mechanic by trade, fixed up our first truck in 1950. This was a model A Ford previously used as a chemical truck. He installed a pick up box on the rear with a canvas to protect the equipment. The driver was left open to the air in the front. This was quite the experience in the winter months. Signals before the age of plectron radios were sirens and numbered blast on the air horn. This system in some cases gave the general public an equal opportunity to know the location of the fire, and often created traffic as well as spectator problems. Since it is the primary purpose of the Fire Police to help the apparatus and firemen get to the scene of the fire safely and without hindrance from the citizens, the corners on the way to the fires were covered in leap frog fashion and thus established fire lines at the scene of the fire. Proceedings were started soon after the company was formed to obtain a New York state Charter. After three years of delays a certificate of incorporation was received at the company meeting on December 21, 1954. It was recorded with Suffolk County Clerk and then placed in the Southampton Fire department safety deposit box. Council, who was preparing a new budget for February of 1957, directed the Fire Police to determine the type of new truck and equipment needed. The cost was to be included in the council budget. 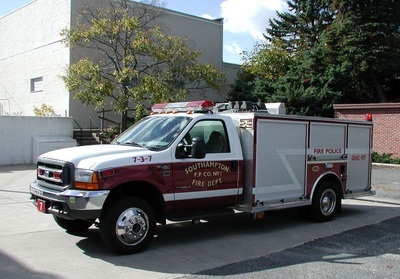 After recommendations of the truck committee, the Fire Police asked council to included $5,500 for a new Fire Police truck. Since there was no available commercial or utility bodies that would fill our needs for the new truck chassis, the truck committee of Lawrence McMahon, Malcolm Terry, Donald Moore and William McDonald designed the truck body similar to other departments, and drew up specifications for its construction in 1957. The new truck was delivered in March of 1958 and was fully equipped. The resuscitator that was previously carried on the Hook & Ladder was now our responsibility. While the Windmill Lane firehouse was being reorganized to make room for the new truck, it was temporarily garaged at the most convenient place in town – the rear of Bobby K’s Bar on Elm Street. The Fire Police truck at one time was chosen as a temporary means of transportation for a portable water pump and carried two hydro-pacs with wet suits. Members of the company were sworn in for the first time as Fire police by Richard Mahr, department secretary, at the June 1957 meeting. The by laws were amended to increase the company compliment to twenty members at the June 1958 meeting. The by laws were amended again in March of 1959 to create the office of 2nd Lieutenant. At the 1958 company meeting, the Fire police approved the action of council to create the Southampton Firemen’s Benevolent Association. This was after a great deal of ground work was done by Milton Enstine of the Agawam Engine Company, Clarke Smith Sr. and Malcolm Terry of the Fire Police. These gentlemen heard of a plan used by Port Jefferson Department to start a Benevolent Fund. They were invited to look over the plan first hand and as a result they brought it home almost word for word. It was the start of the Benevolent Fund in Southampton Fire Department. In 1966, a memorial plaque was designed so that names of any departed active members might be placed on it. The names and badges of William Holdsworth and Donald Moore are now listed on this honor roll. Books in their memory were donated to Rogers Memorial Library; “Dead Whale on a Stone Boat” in memory William Holdsworth and “Pictorial History of the World’s Greatest Trials” in memory of Donald Moore. Francis Jessup, who died after retiring from the company, is also listed on the honor roll. On October 16, 1979, Janet DeCastro was elected a probationary member of the Fire Police Company. Thus, she became the first women to join the Southampton Fire Department. After 20 years of service, the old Fire Police truck was to be replaced. A truck committee of Mark Poremba, Don Stringham and Peter Downs was authorized to design and make out specifications for a new truck. The new truck plans were approved and it was subsequently built by Pierce Manufacturing and placed into service in June 1980. The Fire Police are also responsible for supplying air tanks for our Scott packs. The following events stand out in the memories of those present at the time, and were events that tested the capability of the Fire Police Company as a whole. - The Strong Oil fire on Labor Day 1967 made it necessary to reroute holiday traffic around Watermill Village for 9 hours. - The Seven Ponds Inn at Seven Ponds Bridge and Montauk Hwy. was another memorable fire that lasted from 3am until 11 am one Sunday morning. - The Park Hotel fire kept the Fire Police busy with crowd control, as well as traffic concerns. - The Horn fire in June of 1950 on Gin Lane and Little Plains Road started at 11am and lasted until 2am the next morning. We had to post guard shifts until the insurance company arrived. - As for less harrowing experiences, the Fire Police have manned corners at the Fourth of July parade and the Homecoming parade and Bonfire at the High school. - A few years of duty at the Forth of July Fireworks at Coopers beach saw the worse traffic jams than on the LIE at rush hour. Today, with the increasing population of the community, the Fire Police play an ever important role in traffic control, crowd control and firemen’s safety.